Have you ever wished you could have told yourself something to help get through the challenges you faced? “Don’t beat yourself up for every mistake and failure”, “network, and find yourself a good mentor”, and “dare to break the mould”, are just some of the things women leaders wished someone had told them when they were younger. In this sixth part of our 16-part series on women leadership, and bridging the gap in gender diversity, see what career advice women leaders such as Carbon Black’s Sandra O’Sullivan, HireRight’s Ko Hui Yen, Johnson Controls’ Yar Ai Lin, and many more would give to their younger selves. Be daring to rise up to the occasion each time an opportunity presents itself. The mindset “I am not ready” has to go. Don’t beat yourself up for every mistake and failure. Don’t take it on as a defining moment for your sense-of-self. Learn, move on quickly, and do better next time. Beating yourself up takes tremendous energy, which can be better channelled towards the next great idea/innovation. Ultimately, no one remembers the failures and when you hold onto them, you hold yourself back. Your greatest fear is you don’t want to disappoint people who are important to you, which prevents you from taking risks. Don’t let fear of failure prevent you from pushing yourself – it is only through stretching that you know who you truly are and what you are capable of. Having strong self –belief and advocating your beliefs is key, but at the same time it’s important to always maintain an open mindset and respect other people’s values and ideas. By absorbing your surrounding environment you will develop informed opinions which will help you to see the bigger picture. Be open-minded about the possibilities that come your way. It is important to embrace your strengths and continue to grow a career in something you feel passionate about. When you first start out, you should never stop learning and surround yourself with positive people. 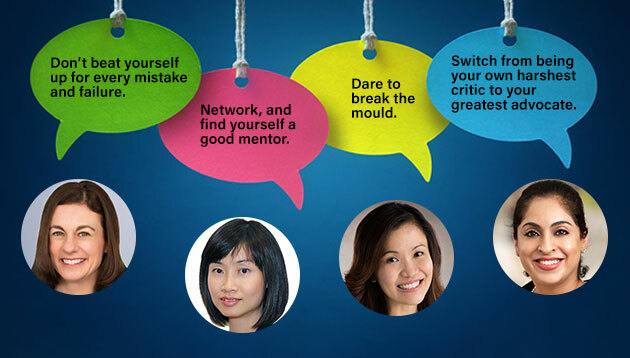 Network, and find yourself a good mentor to help you navigate the nuances of the corporate world. Leveraging on informal networks has been proven time and again to be instrumental to senior leaders’ career success – and with the advent of social media making it easier than ever before to reconnect with old contacts, there are no excuses. Never let your ambition be held back by traditions or failure. Even though being an engineer was not my childhood dream job, I was open to new possibilities and developed my interest in this field. Don’t be surprised at the potential something new has to offer. Dare to break the mould: Diversity is a unique strength women can bring to the table. I would tell myself not to listen to the voices of doubts, both externally and from within. Growing up, I did not see many female professionals being featured as success stories. When I entered the workforce, I reminded myself that I am capable of doing anything. Gender doesn’t determine the outcome – you can achieve anything if you put the right mind and heart into it. That’s the best advice I have given myself. Looking back, I would be more patient and thoughtful in my decision-making. Earlier in my career, I acted mostly on emotion and impulse, which tended to make the road tougher in the long run. My experience has shown that stepping back and weighing your options will help you make smarter decisions. Create a vision for yourself, your life and your career. You will encounter challenges as you work towards your goal, but do not let that deter you from achieving what you want to. Allow yourself the time to learn and grow in the process, and have the patience to handle the adversity when it comes your way. Most importantly, keep a positive outlook that nothing is impossible until you’ve tried. Always be inspired by leaders who can speak up for others, draw out the best in colleagues and strike a balance between family and work. Focus on your inner will to excel even beyond the workplace, as this is key to success, while also respecting your own limits. Switch from being your own harshest critic to your greatest advocate. If you don’t bet on yourself in a fight, no one else will. Don’t let your inner voice limit your dreams and ambition – give yourself a chance! Always remember that setbacks don’t make you a failure. Keep getting up. We still have 10 more parts to our series focusing on women leadership, and bridging the gap in gender diversity in organisations. Stay tuned for more! Photo caption: From L-R: Sandra O’Sullivan, Chief People Officer, Carbon Black; Ko Hui Yen, General Manager, APAC, HireRight; Yar Ai Lin, Regional Head, Industrial Refrigeration (SEA), Building Technologies & Solutions, Johnson Controls; and Amarjit Kaur, Partner, Withers KhattarWong LLP. Those in Singapore aren't doing much better at about 4 hours taken - and unfiled expenses are benefiting companies by $15.2bn year..